To Comrades Andreyev, Beria, Voznesensky, Voroshilov, Zhdanov, Kaganovich, Malenkov, Mikoyan, Molotov, Stalin, Khrushchev, Bulganin, Kosygin and Shvernik. 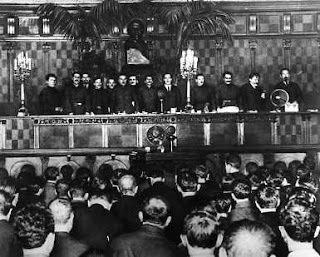 To members and candidates of VKP (b) = All-Union Communist Party (Bolsheviks) Central Committee. For your information: record of conversation of Comrade I.V. Stalin with the group of British Labourites-deputies of parliament on October, 14, 1947. Attendants: Zilliacus, White, Thomas, Allen, Bing, Lee, Champion, Parkin and Hughes (secretary of delegation). Comrade STALIN asks how the trip is going on. ZILLIACUS answers that the trip is very good. Comrade STALIN asks whether the guests are tired. ZILLIACUS answers that they have too many new impressions to think of weariness. Comrade STALIN says that the guests have apparently met with Molotov. ZILLIACUS answers that, they have visited Molotov yesterday and besides, being in Moscow, they talked to different heads of cooperatives. They have also visited a number of factories, theatres, health resorts and saw different places of interest in Moscow. Comrade STALIN says that, he is at his visitors’ service. *The so-called Keep Left group in the Labour Party was set up in 1947 after the publication of a pamphlet bearing the same name. Members of the group positioned themselves as supporters of democratic socialism and spoke out actively on foreign policy. The group defended in particular the idea of a third force in European politics that was allied neither to the USA nor to the USSR. At the peak of its popularity the group numbered some 80 people. See SAVILLE, J., The Politics of Continuity: British Foreign Policy and the Labour Government, 1945-46. London & New York, 1993, p. 61. Besides, all the group members believe that it is necessary to find ways for Britain to avoid economic crisis which should come in a year or two. Zilliacus introduces his comrades and says that until recently, all of them didn’t speak much in Parliament on foreign policy issues, but were mainly busy with economics. The fact that these people have now decided be more active on foreign policy reflects the evolution taking place in the Labour party. Members of delegation feel very grateful about meeting with Generalissimo Stalin. It’s a great honour for them, and they deeply appreciate the value of this friendly gesture. Comrade STALIN says that this is simply hospitality and that there’s nothing special about it. PARKIN sets a question to Comrade Stalin: whether the Soviet Union wishes to cooperate with Great Britain now. ZILLIACUS says that, he and his comrades understand that some of their questions will seem extremely silly. But these very issues are now being discussed in the west. Answers to these questions given by such an authority will be of great help for the delegation members and their work in their homeland. Answering to Parkin, Comrade STALIN says that, the Soviet Union definitely wishes to cooperate with Britain. PARKIN declares that, he and his comrades consider it a duty to resist the point of view that the Soviet Union intends to isolate itself from other countries and that people trying to cooperate with the USSR just waste their time in vain. Comrade STALIN says that, there were such conversations on the Soviet Union’s isolation after the First World War, too. For a period, they even managed to isolate the Soviet Union. But later they had to have diplomatic relations with it, and then during the Second World War - even to conclude the treaty of alliance. The Soviet people are not afraid of isolation. They are used to such conversations. BING specifies that the British Labourites present here are especially interested in trade between the USSR and Great Britain. First of all, it’s because Great Britain needs raw materials, food and other goods, which may be supplied by the Soviet Union. Second, as socialists they want a commercial treaty which will help to get rid of dependence on American capitalism. Comrade STALIN says that, the Soviet Union also wants to expand economic relations. It is interested in development of relations and in rapprochement between Britain and Russia. Comrade Stalin thinks that these two countries may be, if not allies, then at least good partners in common business. However, he is not sure that the present British government also wishes rapprochement with the Soviet Union and establishment of close trade relations. ZILLIACUS asks whether Generalissimo Stalin believes that Great Britain and the Soviet Union will really manage to develop in Europe a common policy on economic reconstruction and political organisation on the basis of the existing alliance treaty. In other words, would it not be easier instead of a treaty revision to search for forms of cooperation on the basis of existing positions of this agreement? Such cooperation could be in the form of regular conferences or additional agreements concluded according to this or that article of the alliance treaty which provides economic and political cooperation in Europe. Comrade STALIN asks whether Zilliacus is familiar with the text of existing treaty between Great Britain and the USSR. Comrade STALIN says that, unfortunately, this agreement does not give basis for cooperation in economic and political spheres. The present agreement has turned into a piece of paper. As everyone present knows, the agreement consists of two parts. The first part concerns the War between the Soviet Union and Great Britain on the one hand and Germany - on the other hand. The agreement provides rendering of complete mutual aid until a definite defeat of Germany. But now that victory has been achieved and Germany is defeated, this part of the agreement became pointless. This part of the agreement became history, and it cannot be a guideline any more, since the common enemy has been defeated and the war is finished. The second part of the agreement concerns issues of the post-war period. This part states that after the war relations of mutual aid will continue for 20 years, unless there is a new international organization that will undertake resolving the issue of protecting its members from aggression. But such an organisation has already appeared. It is the United Nations. Had it not appeared, had it taken upon itself to protect nations against aggression, then this part of the agreement would have retained a purpose. But since such an organization - one in which both England and the Soviet Union participate in - has emerged and so second half of the agreement is rendered becomes pointless and recedes into history. Therefore, Comrade Stalin does not know how this agreement can become a basis for economic and political cooperation between Britain and the USSR. He does not understand how this can be feasible. In his opinion, it is impossible. That is why the issue of modifying the agreement arose and making improvements to it, so that it is not connected to issues regarding the already-finished war and can continue to stay in effect alongside the United Nations. In other words, the agreement should be like the agreement with France, which is not connected with the last war and with the existence of the United Nations. If the agreement between Britain and the USSR is repaired, it may be the basis for improving British-Soviet relations. As to the general question posed by Zilliacus, this question seems to boil down to whether it is possible for Britain and the Soviet Union to cooperate in political and economic spheres in Europe. Comrade Stalin believes that it is possible and desirable. PARKIN declares that, due to the stated doubts on whether the present government of Great Britain wishes rapprochement with the USSR, it would be useful to discuss this issue frankly. Why is there such an impression? He, Parkin and his companions would like to stress that, in any case, that the British working class sincerely wants rapprochement with the USSR. They think that the members of the government also want to cooperation to be established. However, some people in Britain oppose such cooperation. The task is to force the government to conduct socialist foreign and domestic policies more actively. The conclusion of a commercial treaty would be most useful for this. 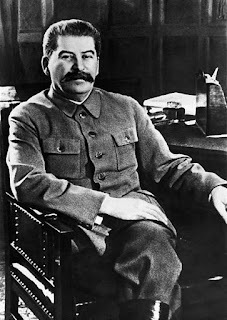 Comrade STALIN says that, in the last two years the Soviet people have become convinced that the present British government does not want to improve or cannot improve relations with the Soviet Union, as someone is hindering it. Facts prove this. It was Bevin who raised the issue of prolonging the alliance treaty. However, an extension of this agreement is impossible and aimless, since it became pointless, as was mentioned before. The Soviet Union raised the issue of improving the agreement which needs to be amended. The British government verbally agreed to this, but negotiations have failed. The Russians only want an agreement similar to the one with France **. They want the content of this agreement to correspond to its name. But the situation is not improving. The British have proposed conditions which only worsen the current agreement, while the Soviet Union wants it to be improved. ** The Anglo-French Treaty of Alliance of 1947, signed on 4 March in Dunkirk by foreign ministers Ernest Bevin (Great Britain) and Georges Bidault (France); intended to provide military assistance in the event of either party being drawn into a war with Germany. Such is the first fact. As for the trade negotiations, in due time a proposal was made on big deliveries of goods. It was suggested that Russians deliver mainly timber and grain, and the British - various equipment, such as rails for narrow-gauge roads and pipes for the oil industry. All this equipment is available in Britain and presents no difficulties. However, there were difficulties. The Soviet Union has agreed to deliver grain and timber in great sums, while Great Britain has not given consent to deliver the equipment even for one third of the cost of Soviet deliveries. The British wanted the Soviet Union to be paid in sterling pounds for its deliveries. Considering the economic situation in Britain, the Soviet government agreed not to necessarily demand dollars for the deliveries, but expressed a desire that a certain part of Soviet goods to be been paid with British equipment deliveries. There is nothing unusual in this suggestion, yet it was not accepted. Second, there were difficulties regarding credit. The Soviet government wants half the credit payment to be delayed, i.e. the interest on this half not to be paid immediately, but in several years. Perhaps it would be more correct to preserve the former terms of credit? Comrade Stalin thinks this would be wrong and unfair. The Soviet government has only suggested that Britain gives it the same concessions that it gave to France. It is an issue of old wartime debts. The French received such concessions on their loans. During the war the Soviet people, to my mind, were of no less assistance than the French (delegates smile). Then why are we refused similar concessions? We believe that this is discrimination. We got the impression that the British government wants to have negotiations with the USSR, but does not want an agreement with it. We have the impression that, for some reason, it is interested in initiating negotiations, then ceases them, then renews negotiations again, but is not interested in concluding an agreement. It’s probably being done to show to the British working class that it is impossible to come to an agreement with the Russians. Perhaps it’s a method of struggle against the Soviet Union’s influence in Britain and in Europe? Perhaps it’s the Labour party’s method in the struggle against communism? Perhaps they think that the agreement with the Soviet Union shall strengthen the authority of communists in Britain? Probably the British government, seeing that British working class is looking for friendship with the USSR, feels that sometime it is necessary to come to an agreement, but someone prevents it from doing so. There question arises as to whether the British government is truly independent? Doesn’t some outsider dictate to it? LEE says that, he and his colleagues are grateful for Generalissimo Stalin’s detailed answer. It’s very useful to learn his point of view. On his behalf Lee will try to answer some of the questions posed by the Generalissimo. It is true that there is no consensus within the British government on many important issues. The British government’s politics really does have tendencies that may not lead to an agreement with the Soviet Union, but to quite the opposite. Lee believes that perhaps due to the difficult economic situation in Britain, the Treasury believes that a conclusion of such an agreement with the Soviet Union would be an obstacle for obtaining more favourable conditions from the United States. Lee will try to briefly describe the about what is at the heart of the political struggle with the Labour Party. Firstly, it should be noted that the Labour Party is not a Marxist party. It consists of a number of different groups and trends. It is rather like a popular front, as this term is understood on the continent. At various times different trends prevail in the Labour Party. First, one group becomes more powerful, then another. But the Labour Party’s close relationship with the trade unions indicates that the main source of its strength lies precisely in the labour movement. And the working class would undoubtedly be enthusiastic about an agreement with the Soviet Union. Lee remembers quite well how during the war his comrades, workers of machine engineering industry were happy to produce equipment for the Soviet Union and at the same time refused to carry out an order from South Africa and from other countries. Thus, there is no unanimity in the British government. But at present, when labour upsurge is needed from the public in order to increase export production, the government will need more vigorous implementation of socialist measures. In this regard, one can hope that it will be possible for the UK Government’s policy to change to such an extent that Generalissimo Stalin would soon be able to change his views on British politics. THOMAS adds that, the UK is facing an economic crisis, and it must now solve fundamental political issues. The trade agreement would have a profound impact on international relations and would serve as a solid foundation for improving Anglo-Soviet relations. Since both governments agreed to conduct trade negotiations, it will be a great tragedy if they fail to achieve positive results. BING says that, whatever the opinion of some ministers in the British, there are people, such as the new Trade Minister Wilson, who sincerely wish to improve Anglo-Soviet relations. It is possible to speak candidly about it, as it is well-known that there are also ministers in the government with a different point of view. But the question of improving economic relations depends not on individuals, but on the actual state of affairs. The success of Cripps' plan*** depends on the possibility of increasing industrial production. Before the war Great Britain’s share was 20% of the global exports of manufactured goods. But at that time Great Britain also exported a significant amount of raw materials, including coal. It can’t export raw materials at present. Therefore, in order to ensure a favourable trade turnover, it is necessary to significantly increase the export of industrial products. However, history has shown that in the last two decades there was only a slight increase in trade of manufactured goods. Given the nature of capitalist production, it is difficult to imagine a significant increase of this trade in the coming years. Also, it is necessary to mention that English export trade develops almost directly proportional to the increase in the US national income. The reason lies in the fact that it is the United States which provides the purchasing power of other countries, which enables them to buy goods from the British. All this suggests the need to export British goods to countries with a planned economy, which do not depend on American capitalism. Comrade STALIN says that nowadays, there are plenty of markets for the sale of goods since Germany and Japan are no longer competitors in trade. BING answers that, many countries have a desire to purchase goods, but do not have the purchasing power. ALLEN notes that, according to Bing’s theory, it appears that trade can only develop when it’s being financed by American capitalism. Comrade STALIN says that this is certainly wrong. Allen said that the United Kingdom cannot live forever, like an orphan, dependent on the United States. The natural market for England is not the United States, since all that Britain produces, the United States can produce cheaper and better. THOMAS remarks that, perhaps the USA produces goods cheaper than Britain, but not better. ALLEN continues his remarks and says that Britain needs to look for other markets in the East. The natural channels for British trade are eastwards. Soviet Russia and other East European countries have money to buy from Britain those goods that the United States will not buy from it. Champion specifies that, in his opinion, the exacerbation of the economic crisis may lead to the creation of an economic bloc in Western Europe, which will serve as a counterweight to the American bloc. Comrade STALIN replies that, this is not ruled out. Comrade Stalin says that in their remarks Allen, Lee and Bing spoke about the global trade or barter. Comrade Stalin understands that the main assistance for Britain comes from the United States. This is quite right and should not be neglected. But this situation cannot last for long, as Britain produces almost the same goods as the United States. America, for example, does not need British equipment and machines. Therefore, Britain won’t be able to receive food supplies and raw materials from America for a long time. It would be quite natural for Britain to establish ties with countries that need British equipment and can deliver it raw materials and food supplies. Comrade Stalin thinks that in several years, and especially if there is an economic crisis, Britain, as a country that produces equipment but not enough the necessary food supplies for itself, would have to make contact east European countries, where the industry is developed well enough to consume British machinery, tools and equipment. This path is inevitable for Britain. If Comrade Stalin was British, say, a member of the Labour government, he would have accepted such a policy. He would not have weakened economic ties with the US. He would have continued these relations, but at the same time he would have established relations with countries that are in need of British equipment and can deliver food supplies. He would have demanded that America compromise, and if it didn’t provide more favourable terms, he would have begun to strengthen ties with other countries, from where Britain can receive food supplies. This would then have given Britain an opportunity to influence America, and America would become more compliant. Then Britain’s exclusive dependence on America would have ceased, and Britain, having become more independent, could then conduct its policy and manoeuvre using these opportunities. Champion remarks that, till now, other countries, besides the United States, were not able to deliver necessary goods to Great Britain. Comrade STALIN answers that, this is true, but this period is coming to an end, or has already finished. Russia and other European countries, which already have something and trade between themselves, could supply Britain with what it needs. If it’s not done, if Britain does not look for support both in the USA and in Europe, it will be in a bad situation, it will weaken and completely depend on America. The pound sterling will lose its value. Britain would have to comply with all of America’s demands. Some may think that if Britain behave meekly, if it does make contact with East European countries, then America will appreciate this and take pity on it. It’s naive to think so. In modern life it does not happen this way. Unfortunately, in international it is not the feeling of compassion which prevails but, the sense of self interest. If any country sees that it can occupy and subjugate another country, then it will do so. But if Britain is to be strong, that is before it is suppressed, it will ponder whether this is not dangerous and whether this make matters worse. If America or any other country sees that Britain depends entirely on it and that it does not have any other option, it will devour it. Weak ones are not pitied and respected. Only the strong ones are considered worthy. Comrade Stalin apologizes that his answer was a bit too long. Of course, he does not wish to lecture anyone. But he had to thoroughly answer the question. LEE declares that, he fully agrees with what Generalissimo Stalin said. ZILLIACUS says that he, like Lee, fully supports the views expressed by Generalissimo Stalin. Zilliacus repeatedly spoke about it in parliament and at different meetings in Britain. The main obstacle to such a policy is the Labour government’s attitude towards communists. The Labour government wants to play the role of international Scheidemann*, it wants to do internationally what Scheidemann did within under the Weimar Republic. It presents itself as the defender of Western democracy from communism in cooperation with American capitalism. That’s the main difficulty. * Scheidemann, Philipp (1865-1939) - German politician. Social Democrat, Chancellor of Germany from 13 February to 27 June 1919. A supporter of moderate leftist policies directed towards reducing the activities of the revolutionary movement and of seeking a balance between forces of the right and the extreme-left. Zilliacus always said that, in many European countries communists are the real representatives of the working class and completely represent the workers’ interests. As for Britain, it has place for only one workers party, namely the Labour party which communicates with workers via the trade unions. Therefore, Zilliacus and his allies are in favour of the British Communist Party being disbanded and for communists to join the Labour Party. However, the situation is different on the continent. There, the communists in many cases are the real representatives of working class**. ** The Communist Party of Great Britain was founded in 1922, and achieved its greatest success in the elections of 1945, gathering 98,000 votes (0.4%), and gaining two seats in the House of Commons. The part was led by Harry Pollitt from 1922 to 1945. *** Ernest Bevin was head of the Transport and General Workers’ Union from 1922 to 1945. The recently-published manifesto of nine European Communist Parties* will be exaggerated in Western Europe in every possible way and will be presented as a Comintern revival. Again, they will say that communists are organising a plot against civilization in order to establish world supremacy. Zilliacus certainly does not believe all of this, but he would be grateful if Generalissimo Stalin expressed his opinion on the meaning of this declaration of nine Communist Parties and state whether it is Comintern revival or modification of the communists’ opinion concerning national independence and the democratic systems of different countries. *Refers to the establishment of COMINFORM (Communist Information Bureau), an association of European Communist parties, which included Communist Parties of nine European Countries – Bulgaria, Czechoslovakia, France, Hungary, Italy, Poland, Romania. The headquarters were originally established in Belgrade, Yugoslavia. Comrade STALIN says that, trying to revive Comintern would be utopian, and communists are not utopians. The Comintern appeared after the First World War when communist parties were still in their infancy in a number of countries. It played its role in establishing communication between workers of different countries and helped to develop leaders of working class. Having done this, it has lost its primary importance. Now in most, or at least in many countries, the Communists have grown into big parties. However, Comrade Stalin excludes Britain, where there are number of different conditions. As for Italy, France, Poland and some other countries, there the Communist Parties have become influential, large mass parties with own leaders**. ** In French elections, held in November 1946 the Communist Party came victorious, securing more than 5 million votes (28.3%). In Italy, in 1946 the Communist Party gained more than 4 million votes (18.9%), occupying third place. Poland was in the area of Soviet influence and the elections of 1947 were generally symbolic in character, with results being rigged, thus securing the communists 80% of the votes. See Petrov, N. V., According to Stalin’s Scenario: The Role of the NKVD-MGB in the Sovietisation of Central and Eastern Europe, 1945–1953 (Moscow, 2011), p. 162-187. *** This refers to the establishment on 21 April 1946 of the Socialist Unity Party of Germany in the Soviet Zone of Occupation. This is possible in other countries as well. At present, trying to administer these mass parties from one centre would be quixotic. I believe, there are no more reasons for the Comintern’s existence. Returning history would be silly. I understand the declaration of nine Communist Parties the following way: communists want to defend, above all, the independence and sovereignty of individual countries and the durable peace between them. They want to continue fight for democracy against reaction and the remnants of fascism. Further, they want to seriously improve the situation of the working class, and they will always be against anyone who tries to prevent this. They want to resist imperialism in general and the world supremacy by any single country. I think that if the socialists do not understand the need to tackle these issues, then there is a danger that the communists themselves will aggregate all the democratic forces themselves. THOMAS (smiling) thanks Comrade Stalin for the warning. Comrade STALIN (smiling) says: "Don't mention it". I was asked here, whether the manifesto of nine Communist Parties shall change Soviet Union’s policy. It does not change and cannot change Soviet policy. The Soviet Union supported and continues to support improvement of political and economic relations with all the countries, including US and Britain. If other countries want to establish good relations with the Soviet Union, it will be welcomed by the Soviet Union, irrespective of the economic system of this or that country. If they do not want it, we will try to do without them. We can wait for others to see reason. We are patient people. ZILLIACUS thanks Comrade Stalin for the conversation. This conversation will be of great use. It will strengthen the determination of the members of the delegation to consistently struggle for the cause of mutual understanding between the USSR and Great Britain and for the cause of world peace. Comrade STALIN says that, on his own behalf, he would like to thank the delegation for giving him a chance to talk heart-to-heart with the representatives of the British working class. This gives Comrade Stalin great pleasure. Whatever happens, no matter what the governments are, workers of Britain and Russia shall always remain friends. BING expresses gratitude for the courtesy and hospitality with which he and his comrades were received in the Soviet Union, and in particular, in the south, in Sochi. He would like to mention that the delegation was greatly assisted by VOKS*, as well by the people who personally served it. *The All-Union Society for Cultural Relations with Foreign Countries (Russian acronym VOKS, 1922–1992) besides fulfilling the functions of maintaining and developing cultural ties, played a role as a propaganda organ. Conversation lasted for 2 hours. Recorded by [signature] (O. Troyanovsky). mailing of conversation between Comrade Stalin and the group of British Labour Party Members of Parliament. Andreyev, Andrey Andreyevich (1895-1971) - party and state leader in the USSR. Chairman of the Presidium of the Supreme Soviet of the USSR (1938-1946), Deputy Chairman of the Council of Ministers of the USSR (1946-1953). Beria, Lavrentiy Pavlovich (1899-1953) - party and state leader in the USSR. People’s Commissar of Internal Affairs (1938-1945), Deputy Chairman of the State Defence Committee (1944-1945), Soviet Minister of the Internal Affairs (March-June 1953). Voroshilov, Kliment Yefremovich (1881-1969) - party and state leader in the USSR. Chairman of Allied Control Commission in Hungary (1945-1947), Deputy Chairman of the Council of Ministers of the USSR (1946-1953), Chairman of the Presidium of the Supreme Soviet of the USSR (1953-1960). Zhdanov, Andrey Aleksandrovich (1896-1948) - party and state leader in the USSR. Secretary of the Central Committee of the All-Union Bolshevik Communist Party (1934-1948), First Secretary of the Leningrad Regional and City Committee of the All-Union Communist Party of Bolsheviks (1934-1945), Chairman of the Council of the Union in the Supreme Soviet of the USSR (1946-1947). Kaganovich, Lazar Moiseyevish (1883-1991) - party and state leader in the USSR. Deputy Chairman of the Council of People’s Commissars (1944-1946), Minister of the Building Materials Industry (1946-1947), First Secretary of the Central Committee of the Ukrainian Bolshevik Communist Party (1947), First Deputy of the Council of Ministers (1953-1957). Malenkov, Georgiy Maksimilianovich (1920-1988) - party and state leader in the USSR. Deputy Chairman of the Council of People’s Commissars (1944-1946), Deputy Chairman of the Council of Ministers of the USSR (1946-1953), Chairman of the Council of Ministers of the USSR (1953-1955), Deputy Chairman of the Council of Ministers of the USSR (1955-1957). Mikoyan, Anastas Ivanovich (1895-1978) - party and state leader in the USSR. Deputy Head of Government of the USSR (1937-1955), Minister of Trade of the USSR (1953-1955), First Deputy Chairman of the Council of Ministers of the USSR (1955-1964), Chairman of the Presidium of the Supreme Soviet of the USSR (1964-1965). Khrushchev, Nikita Sergeyevich (1894-1971) - party and state leader in the USSR. First Secretary of the Central Committee of the Ukrainian Bolshevik Communist Party (1938-1947), First Secretary of the Moscow Regional Committee of the All-Union Communist Party of Bolsheviks (1949-1964), First Secretary of the Central Committee of the Communist Party of the USSR (1953-1964), Chairman of the Council of Ministers of the USSR (1958-1964). Bulganin, Nikolay Aleksandrovich (1895-1975) - party and state leader in the USSR. Chairman of the Board of the State Bank of the USSR (1940-1945), Minister of Armed Forces of the USSR (1947-1949), Mister of Defense of the USSR (1953-1955), Chairman of the Council of Ministers of the USSR (1955-1958). Kosygin, Aleksey Konstantinovich (1904-1980) - party and state leader in the USSR. Chairman of the Council of People’s Commissars of the RSFSR (1943-1946), Minister of Finance, Minister of the Light Industry of the USSR (1948), Chairman of Gosplan of the USSR (1959-1960), Chairman of the Council of Ministers of the USSR (1964-1980). Shvernik, Nikolay Mikhailovich (1888-1970) - party and state leader in the USSR. Chairman of the Council of Nationalities in the Supreme Soviet of the USSR (1938-1946), ), Chairman of the Presidium of the Supreme Soviet of the USSR (1946-1953), Chairman of the Committee of Party Control under the Central Committee of the CPSU (1956-1966). Kuznetsov, Aleksey Alekseyevich (1905-1950) - party leader in the USSR. First Secretary of the Leningrad Region and City Committee of the All-Union Communist Party of Bolsheviks (1945-1946), Secretary of of the Central Committee of the All-Union Communist Party of Bolsheviks (1946-1949). Popov, Georgiy Mikhailovich (1906-1968) - party and state leader in the USSR. First Secretary of the Moscow City [Communist] Party Committee (1945-1949), Secretary of the Central Committee of the All-Union Communist Party of Bolsheviks (1946-1949), Minister of City Development, Minister of Agricultural Machine Building (1950-1951), Soviet ambassador to Poland (1953-1954). Suslov, Mikhail Andreyevich (1901-1982) - party and state leader in the USSR. First Secretary of the Ordzhonikidze (Stavropol) Regional Committee of the All-Union Communist Party of Bolsheviks (1939-1944), Secretary of the Central Committee of the CPSU (1947-1982). Scheidemann, Philipp (1865-1939) - German politician. Social Democrat, Chancellor of Germany from 13 February to 27 June 1919. A supporter of moderate leftist policies directed towards reducing the activities of the revolutionary movement and of seeking a balance between forces of the right and the extreme-left. Gomułka, Władysław (1905 - 1982) - Polish party leader and statesman. Secretary General of the Polish Worker’s Party (1943-1948), First Secretary of the Central Committee of the United Polish Worker’s Party (1956-1970). Cyrankiewicz, Józef (1911-1989) - Polish party leader and statesman. Prime Minister of the Republic of Poland (1947-1952), Chairman of the Council of Ministers of the People’s Republic of Poland (1954-1970). Kardelj, Edvard (1910-1979) - Yugoslavian politician and statesman. Minister of Foreign Affairs of the FSRY (1948-1953), Chairman of the Federal Assembly of the FSRY (1963-1967). Djilas, Milovan (1911-1995) - Yugoslavian politician and author. Member of the Interim National Assembly, Minister of Montenegro Affairs. Vice-President of Yugoslavia from 1953 - 1954. Dimitrov, Georgy (1882-1949) - Bulgarian and international communist movement leader. Head of the International Department of the All-Union Communist Party of Bolsheviks, Chairman of the Council of Ministers of the People’s Republic of Bulgaria (1946-1949), Secretary General of the Central Committee of the Bulgarian Communist Party (1948-1949). Kolarov, Vasil (1877-1950) - Bulgarian party leader and statesman. Chairman of the People’s Assembly of the People’s Republic of Bulgaria (1945-1947), Minister of Foreign Affairs (1947-1949), Chairman of the Council of Ministers of the People’s Republic of Bulgaria (1949-1950). Gheorghiu-Dej, Gheorghe (1901-1965) - Romanian party leader and statesman. Secretary General of the Romanian Worker’s Party (1944-1954, 1955-1965), Romanian Prime Minister (1952-1955), President of the State Council of Romania (1961 - 1965). Slánský, Rudolf (1901-1952) - Czechoslovak party leader and statesman. Member of the National Assembly (1946-1952), Secretary General of the Central Committee of the Czechoslovak Communist Party (1945-1951). Thorez, Maurice (1900-1975) - leader of French and international workers’ and Communist movements. Secretary General of the French communist Party (1930-1964). Duclos, Jacques (1896-1975) - leader of French and international workers’ and Communist movements. One of the Resistance leaders in France, Interim Secretary General of the Central Committee of the French Communist Party (1950-1953). Togliatti, Palmiro (1893-1964) - Italian politician. Leader of Italian and international workers’ and Communist movements, Secretary General of the Italian Communist Party (1950-1953). Longo, Luigi (1900-1980) - Italian politician, Leader of Italian and international workers’ and Communist movements, Deputy Secretary General of the Italian Communist Party (1946-1964). Kuusinen, Otto (1881-1964) - Finnish, Russian and Soviet politician, chairman of the Presidium of the Supreme Soviet of the Karelo-Finnish Soviet Socialist Republic (1940-1956). Pessi, Wille (1902-1983) - Finnish politician, Head of the Finnish Communist Party (1944-1969). Rákosi, Mátyás (1892-1971) - Hungarian Communist leader. Secretary General of the Central Committee of the Hungarian Communist Party (1945-1948), First Secretary of the Hungarian Communist Party (1948-1956). Farkas, Mihály (1904-1965) - Hungarian Communist leader General Secretary of the Executive Committee of the Comintern (1939-1943), Member of of the Central Committee and Politburo of Hungarian Communist Party (1945-1955), Deputy of the Secretary General of the Central Committee of Hungarian Communist Party (1946-1955). Pollitt, Harry (1890-1960) - British politician. General Secretary of the Communist Party of Great Britain (1942-1956).